Ginger is a flowering plant whose rhizome, ginger root or ginger, is widely used as a spice and a folk medicine. It is a herbaceous perennial crop and grows annual pseudostems about a meter tall bearing narrow leaf blades. The ginger crop likely originated in regions regions from the Indian subcontinent to southern Asia as ground flora of tropical lowland forests. Asian countries like China, India and many other Southern Asian countries still remain the world largest producers while it is also grown and eaten in many African countries. Having originated from Asia and becoming so popular among many other parts of the world, you might still be wondering the factors behind the popularity of this crop. Whether ginger is eaten as a tea ingredient, as a spice or even as a medicinal plant, there are still a lot of amazing health benefits to explore. Ginger aids in relieving joint and muscle pains due to the anti-inflammatory properties found in them. A study previously published in the 'The Journal of Pain' revealed that as an athlete, supplementing with ginger after exercises helps in reducing muscle pain. According to a health specialist, adding ginger to your post-workout meal before retiring daily aids in easing achy muscles the next day. Ginger is related to superfoods like cardamom and turmeric because of its gingerol content. Gingerol is an antioxidant and anti-inflammatory compound and a relative of capsaicin and piperine, the compounds that give chilli peppers and black pepper their respective spiciness. Naturally occurring anti-inflammatories aid in curbing an overactive immune system thereby leading to their importance in the human body. Have you ever taken ginger tea or ginger ale while experiencing nausea? Well if you haven't I suggest you try it the next time you nauseate. Marissa Miller, an American health reporter also reported that sipping ginger drink after a heavy meal is perfect and should be part of our daily habits. according to her, taking ginger drinks after meals will go a long way in emptying our stomachs after an indulgent meal. "It'll help calm your stomach and stave off bloating and gas." She said. According to a recent research, more than 50% of Australians are struggling with obesity. This means complications like high cholesterol and heart disease are all too common there. In addition to reducing the risk of heart diseases, ginger also reduces lipoproteins—a study reveals. Apart from its ability to soothe, another amazing benefit of ginger is the fact that it aids in the regulation of blood sugar. High blood sugar is not god to humans and can lead to health problems like diabetes. According to Dr. Axe, ginger supplementation can not only promote healthy blood sugar levels, but also reduce fasting blood sugar which will in turn keep us sound and healthy. Due to the anti-inflammatory properties of the ginger roots, it can be helpful for easing pain from menstrual cramps. In fact, according to a 2009 study published in the Journal of Alternative and Complementary Medicine it can be as effective as ibuprofen. This is a good news to ladies that experience much pains during their periods. A cup of ginger tea will go a long way towards getting you back to your feet. Ginger reduces the overall risk of diabetes by regulating the body insulin, thereby keeping the human metabolism humming. But don’t just think you can eat ginger-flavoured snacks and be on the right track, says Jaclyn London, a dietitian . "Keep both dried and fresh ginger ginger on-hand for flavoring smoothies and veggie-based stir-frys and soups," suggests London at Good Housekeeping. Some researchers suggest that due to the anti-inflammatory properties in the ginger roots, it might be able to reduce the risk of cancer. It is also worth knowing that ginger is one of the most powerful anti-inflammatories. A 2012 study published in The British Journal of Nutrition found that ginger extract was effective at blocking prostate cancer cell growth. Ginger roots, due to their powerful antimicrobial and anti-fungal compounds help in fighting off cold and other infections. "Mix hot water with two tablespoons of fresh grated ginger, half a tablespoon of honey and juice of one lemon," suggests Marissa Miller at Women’s Health. "Or, toss a teaspoon into chicken soup for some added cold-fighting benefits." 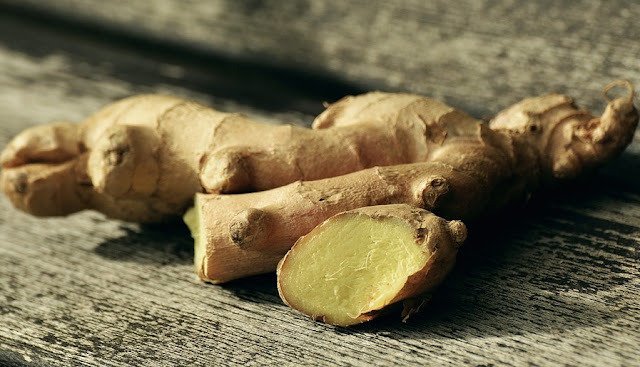 The ginger's anti-inflammatory properties is one its health benefits that keeps on going—especially when it comes to protecting your noggin. Ginger roots help in improve cognitive function and at the same time, decreasing inflammation. This was discovered and published after a 2011 study by the Evidence Based Complementary and Alternative Medicine.